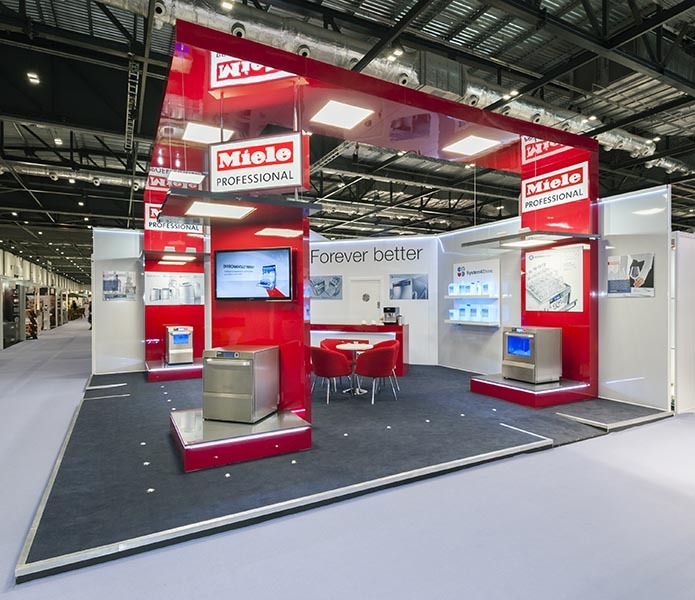 How much does a custom build exhibition stand cost? But I really want a custom build stand – just tell me how much they are! If I could answer that one I’d also be the go-to guy for measuring string. Unfortunately it’s like asking “How much does a car cost?” without specifying which car you’re talking about. 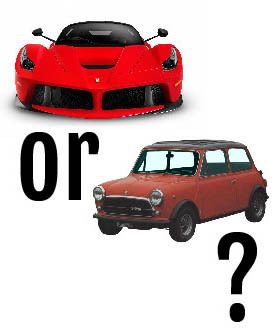 Supercar or Super-Mini? Add to that the fact that you’re trying to cost a stand that hasn’t even been designed yet, and you can see where the difficulty lies! That said, there are things that will affect the cost of any stand and some ‘rules of thumb’ that will at least give us an idea of cost for any stand. 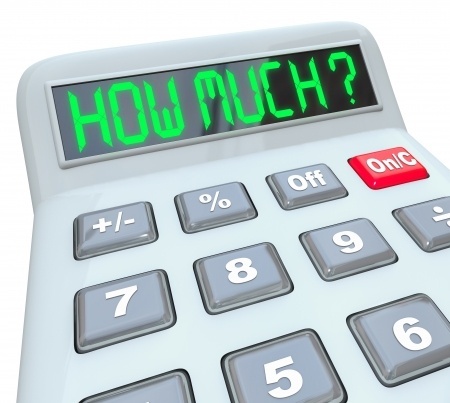 So, whilst the following is not an exact scientific stand costing formula, it will hopefully give an insight into the likely costs you will incur if you decide to go ‘custom build’. So, just like out car analogy that we began with, cost per square metre will depend on many things, but we want to try and make this as simple as possible, right? 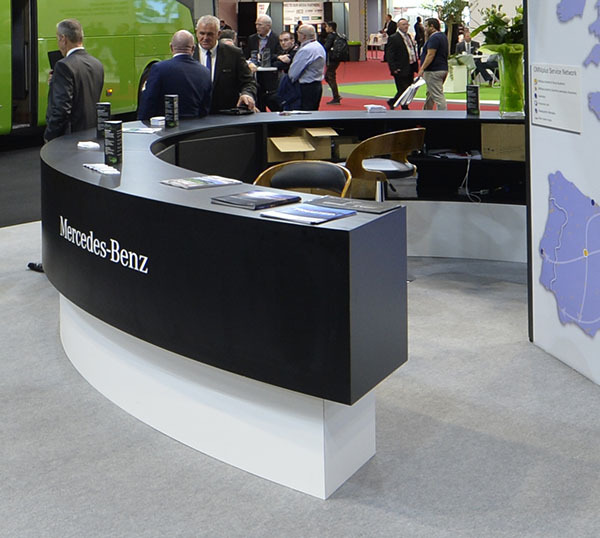 A stand that is light on content – big exhibits taking up space, like vehicles or machinery – will, by definition cost less, as the exhibits are taking up space that your stand builder doesn’t have to build something on. If a 10m x 10m stand consists of a storeroom and a reception counter surrounded by huge machines, then a square metre cost of less than £100 per metre is very likely. On the other hand, a stand full of bespoke display units with private meeting rooms and lots of supporting large format graphics is increasing the amount of physical build compared to the first example. It wouldn’t be uncommon for a build intensive stand to be somewhere between £500 – £1,000 per square metre. In car parlance, are you driving a Skoda or a Bugatti? Both will get you from A to B, but give very different impressions along the way! The bulk of the custom build stands you see around the halls are likely costing somewhere in the £200 – £400 per square metre bracket. This should get you a stand with decent content and finish. The ‘finger in the air’ cost of spending the same on your stand as you do on your space will also give you a rough idea. Less than a week into my first job as a junior designer I was told this little alliterative maxim, and it holds as true today as it did then. Anything curved will cost more than a straight version. Why? The simple answer is labour. Imagine building a 1m cube – six sides, all the same size; takes no time to cut the material and little more to knock the assembled squares into a cube. Now let’s take a 1m diameter cylinder. Top & bottom circles take more time to cut than metre squares (we may even use a cnc machine) and then we need formers and ribs to create the curve, then to skin the outside to create the cylinder. The time it takes to do this compared to a straight sided box is at least double, and that’s where the cost is. Skilled exhibition carpenters are not paid minimum wage – not in the UK anyway! Increase the complexity of the build and you quickly start to increase your costs; partly in materials, but mostly in labour. I had a design in from a company just last month where they’d specified all the walls at 2.85m high. My first question was can we change the wall height to either 2.74m (9 foot) or 3m. 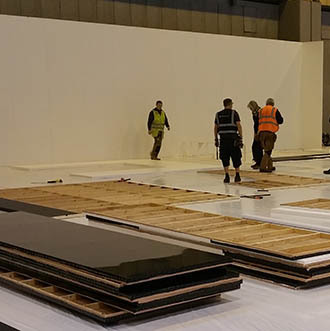 Exhibition companies carry a stock of pre-made wall panels that are recovered every job – they come in 2.44m, 2.74m, 3m and 3.9m heights. With walls at 2.85m we would have had to put a ‘make up’ piece on every wall panel, doubling to cost of the walling on the stand. Using stock wall heights – and widths – will help save making new walls and lots of labour costs. The same holds true with items that have to be built new. Here it is material sheet sizes that dictate costs. Let’s take a straight reception counter – essentially a rectangular box. Mdf comes in 8’ x 4’ (2440mm x 1220mm) and 10’ x 5’ (3050mm x 1550mm) sheets. Specify a counter that is 3.5m long and it will need a join in it (more labour). Make it 700mm deep and it uses more than half of a standard 8’ x 4’ sheet and is wasteful with materials. If it’s laminated, sheets of laminate come in 10’ x 4’ (3050mm x 1220mm) sheets, so again, a 3.5m long x 700mm deep counter will be wasteful with laminate and need more time in the workshop to join two pieces. A good designer working to a budget will know this and keep certain items within ‘sheet sizes’ if possible. Some of this is down to labour costs, some is down to the costs of the materials, but selecting the appropriate finish to match the budget can make a huge difference in the final cost of a stand. Wrapping walls in a standard leather grain vinyl is the cheapest option; gloss pvc will add a chunk in materials and labour. If you want a seamless painted finish to your stand walls then this will cost more again, as they will have to be perfect panels to begin with, then the joints filled and then painted on site – more labour cost. Big graphics are becoming commonplace at exhibitions and with the cost of large format printing coming down, this is an economical way of making a statement at a show with whole walls wrapped in large banner prints. If you want to reuse the same image at several shows, then tension fabric system (TFS) graphics are initially more expensive, but can be reused time and time again. For display units and counters the cheapest finish is emulsion paint, often with the horizontal work surfaces laminated. Laminating is more costly than emulsion paint both in materials and labour, but gives a better finish; although paint is easier to touch up and repair. You then have cellulose or polymer spray paint – this gives a great finish, and you can touch it up if damaged, but is the most costly finish of the three. Joinery has to be perfect or the imperfections will show. Paint isn’t cheap and you need a spray booth and a skilled sprayer to do the work. A recent job we did had half a dozen sprayed units, plus 20m of sprayed walls. The cost of the paint alone was over £2,000; emulsion would have come in at a tenth of the cost. Platform or no platform? 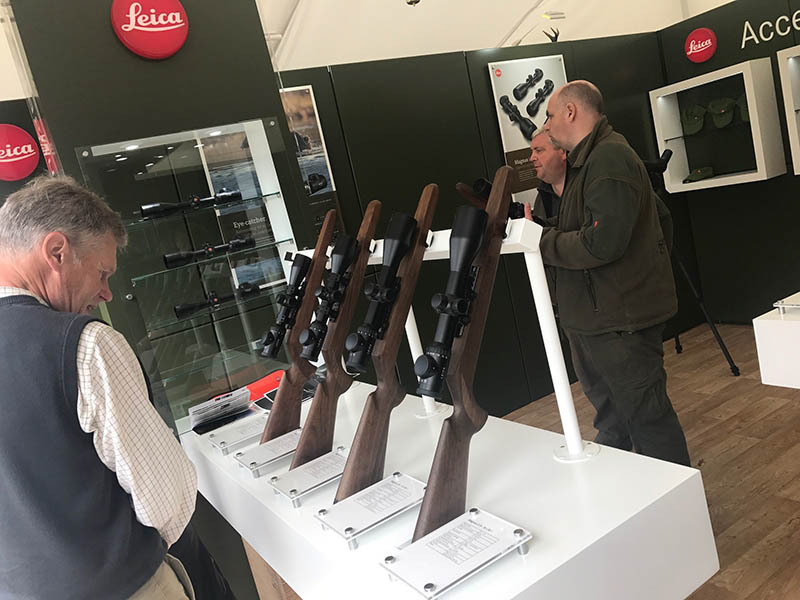 A raised floor is sometimes a necessity if you have no other way of getting power cables and other services around the stand, but can add up to £20 per square metre to the stand costs. 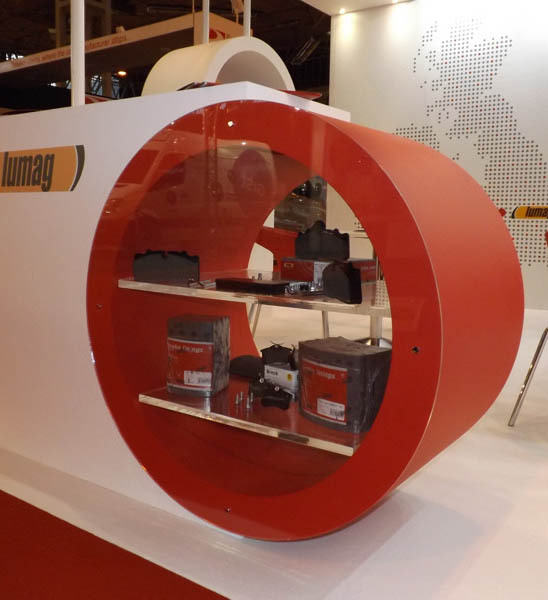 Checking where your service ducts are on the stand at the design stage can sometimes negate the need for a costly raised floor, although a step up on to your stand can give visitors a VIP feeling and set you apart from the aisle. Cord or velour? Choice of floor covering can make a difference too, as cord carpet is half the price of a more luxurious velour or vinyl flooring. Solid floors – parquet wood or mfc – will add even more, both in labour and materials. The range and quality of wood effect vinyls is very good these days and almost indistinguishable from the real thing, though you don’t get that hard wood feel under foot. So the choice of floor and floor covering can have a marked effect on the final stand cost. A quick look at any event furniture company’s website will show a wide range of cost for sitting down. Hire of a basic chair will come in under £30, whereas some of the more designer options will approach £100 and beyond. If you’re seating 40 people in a café area, then the price can spiral if you’re not careful with the choice of furniture. “400 to plug a kettle in? !” Kettles and coffee machines; the bane of my life! A standard domestic kettle will use 3kw of power, as will many coffee machines. If you want to serve hot drinks, a 3kw socket on your stand will cost around the £400 mark in the UK. If you want to use crockery instead of paper cups you’ll need to wash up – that’s going to add another £700+ for a water and waste connection to your sink. 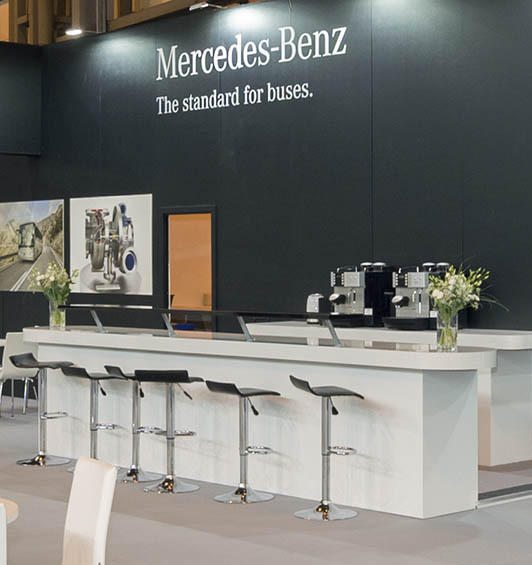 It may be that the cost is worth it as part of the hospitality that you offer to visitors, but be aware that if you’re looking to keep costs down, then having a barista machine in the seating area isn’t going to help! One of the keys to any good stand is the lighting. Get that right and you’re on the right track. What is usually called ‘local lighting’ – light fittings set into or mounted on to the stand structure – is one way of doing it. You can however go up and above your stand with a lighting rig suspended from the venue ceiling. Most venues allow this, and it does look good, especially if you have exhibits where you don’t want any visual obstructions sitting in front of them holding up lighting, but there is a cost. You need truss to hang high powered lighting from, and then you need to hang the truss from the ceiling. At most venues each drop wire (the cable from the ceiling) will cost around £400. So a small square rig will need 4 drop wires = £1,600 before you’ve started. 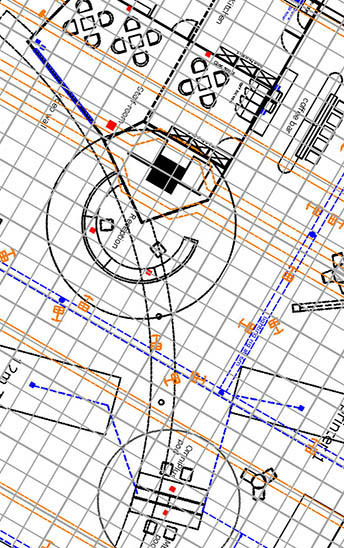 All this comes into play when designing a stand and any designer worth their salt will be keeping these points and more in mind when drawing up plans for your next stand. Most designers are very skilled at designing to a budget, so my parting suggestion would be to tell them what that figure is! Hiding it, or saying that you don’t have a budget, will ultimately end in disappointment for at least one party. You’ll either get an under designed stand that’s under budget but doesn’t do the job, or an over designed stand that you can’t afford. There may have been a case once upon a time where the designer contacted their spirit guide and got it spot on with no idea of budget given by the client, but in reality it’s as likely as a unicorn winning the Grand National. After all that, if you would like a custom build exhibition stand, fantastic! And if you have a budget, please give your designer a clue!